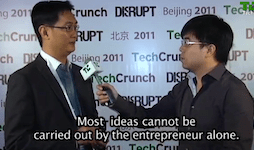 Pony Ma, started as a developer and now is the founder and the CEO of Tencent, the No.1 Chinese Internet company. An opportunity like this could allow me share my ideas with people, including those details that may not be interesting to journalists but of particular interest to entrepreneurs. What do you think is the most difficult part for doing a startup now? Yes, the general business environment is much better now than before. The most importantly, financing is relatively a lot easier. Also, there are more opportunities. However, the most difficult part is also because it’s easier to finance, which means you will have many competitors. There will also be many people or teams who have the same kind of idea with you and also have received fundings. So I think, how to stand out among those similar startups in the competition is the most difficult. I think having a very strong executive capacity including knowing the best about the needs of users and be able to make adjustments based on the response from users and market, is the most crucial. As we can see, there are a lot of teams ran successfully at the early stage with nice ideas, but lack of sustainability. Maybe three months or one year later, their response speed of iteration would slow down, which is a disastrous problem from my opinion. People always say that programmers are geeks, and geeks can change the world. Do you think there will be another Pony Ma in such an environment in China? I believe there will be. I truly believe in it. Because I think that the so-called geeks represent an ultimate demand for the development of a thing or the experience of it. They need to seek the perfection. In fact, you will see that all the popular commercialized products and service are the ones who can meet the ultimate needs of users. Only those can succeed. So there might be such situations like geeks before commercialization. Once he has a nice idea, a team, and the capital to operate well, I believe there would be opportunities to make a product for everyone to wow. In that case, he would succeed. I think first and foremost is to have a good team. In the very beginning, you may be able to write a good program by yourself. But soon enough, it will be developed into a team. Then it will become a bigger team with hundreds of people. Its structure will become increasingly complex. For how to manage the organization with continuously growth, the relationship with your shareholders, your partner, and among the whole team is very important, I think. Therefore, a successful entrepreneur needs to have, or learn and develop such ability. Or at least that you can adapt your mental attitude to such a development, so you can possibly succeed. Most of the ideas cannot be carried out by the entrepreneur alone. So you need to infect others and convince your colleagues, to enter into an entrepreneurial state as you do. Of course you need to adapt the incentive mechanism too, to be more suitable for its development. This is a precondition. What will Tencent do to support young people in China start doing their business? Yes. Our focus for this year is our open platform. We want to open our QQ account system, the whole social networking platforms including our desktop clients and our payment channels to the startups. We do hope that we can help maybe a small team to realize their value on our platform. In fact, it works exactly like the early stage of our company who’d achieved development on the Monternet platform of China Mobile operator. We‘ve been through this process, so we are truly aware of how important an opening platform is for start-up companies.